Gate Access including entrance and exit keypads—this can include keypads for access to climate controlled buildings, restrooms or elevators. The electroinc keypads can be equipped with intercom, cameras, or card readers. 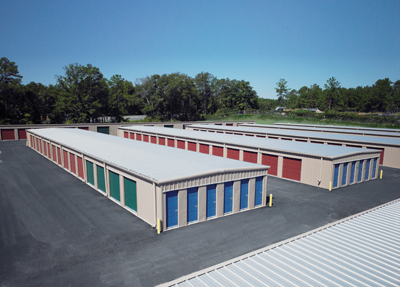 Arm every door — Azstar has been consulting and installing self-storage security for aver two decades and has concluded that the best single security measure to be taken at a self storage facility is to arm every door. When the tenant enters the property and keys in their code at the entry keypad, the system will release the alarm on their door. The opening of any other unit will sound the alarm. Individual door alarms can be wired or wireless—both will work well if properly installed. Azstar recommends wired systems for new facilities and wirless for facility retrofits. Graphics Display — A common and useful adjunct to self storage security is the graphics display—this consists of a computer, software and a large flat screen display for the office. This display will show all unit and their status i.e. rented, vacant or in alarm. The display is color coded for a quick visual identification of unit status. The graphics display is a good tool for the manager and is useful as a sales tool for potential renters. Intercom — it is recommended that all keypads have a working intercom button so that tenants can communicate with the office if needed. This will allow for your onsite staff to effectively and safely communicate with your tenants. Office and Apartment Security—Azstar will install and monitor the office and apartment security system. A two partition panel will be installed that allows the office and apartment to be armed and disarmed independently, but requires only one monthly monitoring fee. Office Telephone and Data Network Cabling—Azstar will not only cable the office (and apartment) for telephone and network use, but will provide everything from telephones to office computers to Internet access if requested by the customer. Background Music Systems—background music throughout the property enhances the customer rental experience and contributes to increased rentals. Azstar will design and install the optimum system for your property. Self Storage: Mini storage security including: access control, Chamberlin Access, PTI, Apex Keypads, Falcon, Falcon XT, Falcon 2000, Taskmaster, Storlogix and Digitech.